Published: November 19, 2013 13:02 By Manjari Saxena, Deputy Editor The weekend tabloid! Last month, Indian master chef Sanjeev Kapoor announced Abu Dhabi would see a Signature by Sanjeev Kapoor, well in time for Abu Dhabi Gourmet food festival in February. But he seemed quite surprised the news was already out when we met him at the Dubai World Hospitality Challenge at Dubai World Trade Centre this week, where he represented Options, his other restaurant in the UAE, to discuss the use of ancient Indian spices and healing properties of Ayurveda in food. “Normally we don’t announce our new ventures so early. But I remember now it was at the Abu Dhabi Grand Prix last month,” Kapoor laughed. “It will be at the National Towers [the building with their offices], which I think is ‘the’ building in Abu Dhabi. So the location is fantastic and the city is in need of something like this. In some sense it was a no-brainer. We hope that we will be able to replicate the success we’ve had in Dubai”. That’s about the only thing that Kapoor is looking at replicating at the new outlet in Abu Dhabi. “It will not be identical to one in Melia Hotel [in Dubai], because then it’ll be boring,” explained Kapoor. “It will have its own individuality. The soul will be the same but it’ll speak for itself. The menu – though it will include some winners from the one in Dubai – will not be the same as in Dubai but the philosophy behind it will be the same”. I remember at tabloid’s exclusive preview of Signature by Sanjeev Kapoor last year, chef Harpal Sokhi, one of Kapoor’s oldest associates, explained the creation of a “different” menu from Options and Khazana. 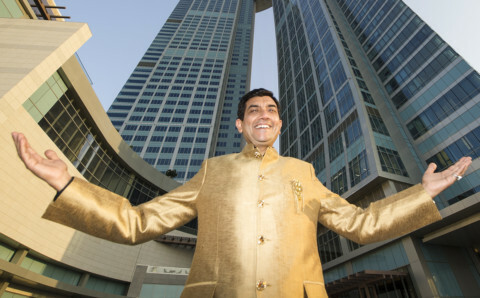 However, this time around, it will be chef Akshay Nayyar, head chef at the Dubai Signature who will take up the reins. “When we launched in Dubai, for Akshay it was quite hurried because he needed to execute everything in a short time, which didn’t give him much time to express himself in what was being done. So it’s his time to present himself. He’s already on it, getting the kitchen ready at Abu Dhabi. “We always love to experiment. Let’s see how it goes. We have a bench of trainers. Harpal is one of them. Akshay is quite keen so we may have him mentor there. Our whole set up is on mentorship. It’s a continuous tradition and we believe each chef has to get that freedom to express as there isn’t anything more important for a chef than that”. Despite being one of the first Indian chefs to make his presence felt in the UAE with Khazana in the late 1990s, coming up with a fine-dining signature restaurant was never Kapoor’s priority. “I didn’t want an upscale one. I wanted to make it more accessible, because that’s what I’d been taught. I could have done multiple outlets but I stayed away. I’m speaking globally not just UAE. Restaurants don’t really excite me so much because I’d done that and it was easy. Then, a couple of years ago, I came across this young chef who asked me why I didn’t have any presence in any hotel. This made me realise that I’d actually skipped a whole generation of chefs who’ve only seen me on TV and they only know the simple things I do on TV. I wondered whether I was sending out the wrong signal. [Restaurants] is the only thing I understand. The rest I do because it’s exciting, it’s challenging and I want to know. Well, every chef wants a restaurant, so the challenge quotient is low. I’ll give it four years. Now we have 55. In the next two we’ll be 100-odd so it’s ok.
“Tell me a chef who has a TV channel of his own, who has four times viewership of Discovery’s Travel & Living channel, who is the number 1 lifestyle channel of India. That’s what excites me. “Also we created a company three years ago called Wonderchef where we train women to create their own business. One of the women here was a lady who donated part of her liver to her drunkard husband but started drinking again after two years and passed away. She had to start her life again. Now she has created her own business after we trained her and she’s happy. These are the things that are so much more satisfying. Doing things that predictable, you’ve already done, is too easy”. Before we finish Kapoor hints at another Options in the UAE. “My friend and partner [in Options] Mohammad Sayed Hussain keeps coming with new ideas. Let’s see. If we get the right location, we’ll definitely do something”. Yet, the knowledge of Indian food globally is more or less restricted to butter chicken and naan, biryani. How much do food festivals and competitions such as the one we were at help make a place for Indian cuisine worldwide? “The way people look at Indian food has changed, but not so much. But in [events] like this India is nowhere,” said Kapoor. “We don’t have, in some sense, a national team. When this type of competitions happen it’s not about Indian food or Thai food – it’s about global talent. The skill sets [we see here] are of a different nature for which Indians have never trained in. It’s not like we don’t have skilled Indian chefs. For example chef Anil Rohira has been world champion in pastry for three years in the US. He may be Indian but he’s in the US team. It’s nothing to do with the Indianness of it, but as a country we have not focused on it because it needs a certain kind of preparation, time and dedication to achieve something like that. Do reality shows such as MasterChef India help? “These shows are more at a home level rather than a professional level. That still is lacking, thought the intent is to create professionals. But that’s possible only if they go for professional training”.